On April 10 2018, Yi Fang Group and Tsinghua University jointly established the "Tsinghua University School of Economics and Management Medical Management Development Fund " to promote the development of the medical and health industry. Recently, Yi Fang Group donated a large sum of money to the Tsinghua University Education Foundation and set up the "Tsinghua University School of Economics and Management Medical Management Development Fund". The fund was established to facilitate the setting up and development of the Tsinghua SEM's Medical Management Research Center in order to support the school’s research in related areas and the training of medical talent. This was yet another intellectual support from Yi Fang for the medical and health industry. At the donation ceremony, Li Jiaqiang, Deputy Secretary General of Tsinghua University and Secretary General of Tsinghua University Education Foundation, extended his sincere gratitude to Yi Fang Group for supporting medical education and research in Tsinghua University. He also expressed high expectations for the outcome of their cooperation to help achieve the goals of "healthy China" which was set by the Chinese government. Jin Dapeng, Chairman of the Third Academic Advisory Committee of the Medical Management Research Center of Tsinghua SEM, Vice President of the Chinese Medical Association, and President of the Beijing Medical Association, also expressed high hopes for the future of this cooperation. 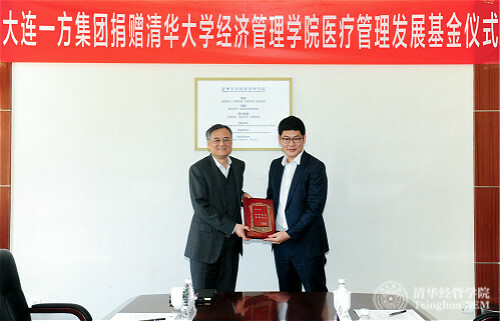 Qian Yingyi, Dean of Tsinghua SEM, expressed his gratitude to Yi Fang Group for its support. He also noted that the Medical Management Research Center will play a even greater role in promoting the development of China's medical and health causes with the help of Yi Fang. As a Tsinghua alumnus, Sun Jian, Vice President of Yi Fang, expressed in his speech that he hopes to work more closely with his alma mater to further benefit society and make satisfying “the people's pursuit of a better life" as a strategic direction for the group. At the same time, the two parties will strengthen their ties and work hand in hand to promote the development of the medical and health industry. 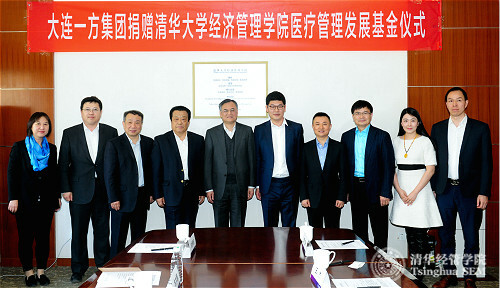 Other attendants at the ceremony included Xue Lei, Director of the Medical Management Research Center of Tsinghua University, Liu Yanxin, Deputy Director of the center and Liu Jian, Vice President of Yi Fang Group. Yi Fang Group has four core businesses: strategic investment, real estate development & management, cultural & entertainment & sport and medical & health. It holds major stakes in Wanda Commercial Real Estate, Wanda Cinema, Jiangzhong Group and AEON Life among many other large companies. The Group has been committed to develop a strategic ecosystem in health industry, and has developed related projects such as Dalian Yijinghui Retirement Rehabilitation Center, Beijing Health Industry Park, Chengdu MFINE Health Mall, and Shenyang Yi Fang Xingren Clinic.